Fila Grant Hill II basketball shoe. 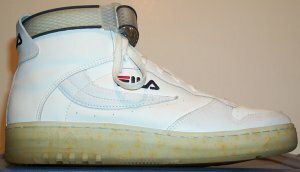 I personally dismissed FILA as not being a serious player in athletic footwear from seeing their early efforts. Too trendy, not technical enough. Do we really need another LA Gear out in the marketplace? My opinion switched over to the benefit of FILA when I saw some local Texas high school basketball teams wearing some unusual looking sneakers and performing very well in them. 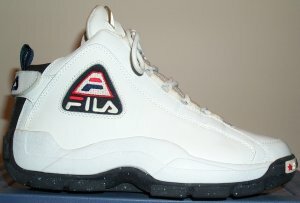 After a quick catalog scan, I recognized the FILA Grant Hill 2 basketball shoe on some very high-performance feet! The Grant Hill is a very popular shoe, compared to many of its Nike rivals. There's one important reason. FILA packs their shoes with value for the money spent. One can buy a pair of top-end Nike shoes, or one can buy a pair of FILA Grant Hill shoes and have a chunk of cash left in one's matching Grant Hill shorts! Back to "Charlie's Sneaker Pages!"